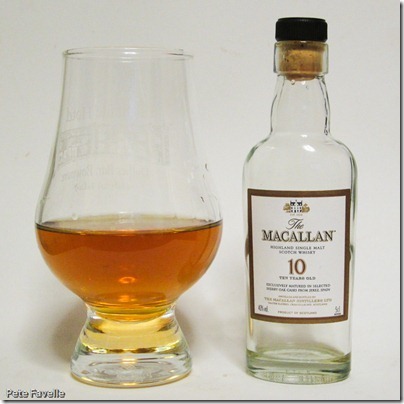 This week I return to a distillery I’ve mentioned before – The Macallan. On this occasion, it’s their 10 Year Old Sherry Oak edition. This is about as young as The Macallan comes, so it will be interesting to see how it stands up. The bottle is one of my miniature collection; I just want to say how nice it is to find that despite being a miniature, the distillery has still used a cork instead of a screw top. I doubt it makes any difference to the whisky inside, but it pleases me! It’s quite a rich amber in the glass, helped no doubt by ageing in sherry casks. The nose is sweet cherry fruit with an edge of buttery vanilla. That fruit comes through on the tongue, along with an almost creamy texture. The raw spirit is just detectable at the end, but considering it’s the baby of the range it’s surprisingly smooth and grown up. The flavours are all coming from the sherry rather than the oak, giving you those really fruity flavours. With water, the fruit fades and the rawness is more pronounced although that vanilla tone is still present. In the mouth, too, the fruitiness is reduced but it’s still smooth, almost creamy and very easy to drink. It’s not a whisky that’s going to blow your mind, but you don’t always want that. It is, however, a solid drinking whisky that deserves a space in the cupboard.